Cool and crisp, this engineered stripe was inspired by traditional fouta textiles used in many Mediterranean countries for everything from towels to bedspreads. Nautica's updated interpretation for bedding is clean, classic and comfortable in an all-cotton, heavy-weight herringbone weave. The yarn-dyed stripes are a soft, medium weight blue and white with an accent of grey at the bed break. 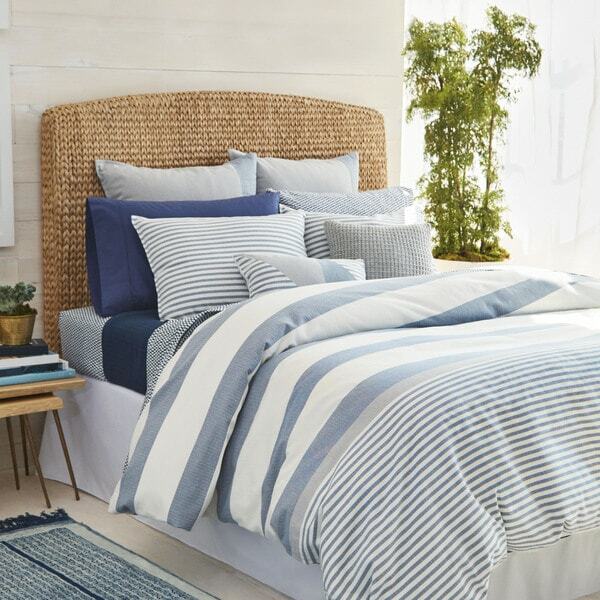 Standard shams echo the thinner stripes at the base of the bed and European shams are color blocked with grey herringbone weave and blue chambray side borders. Accent pillows mix the stripe and solid fabrics enhanced with piecing, taping and stitched details. The comforter reverses to a soft solid gray colorway. Bedding is 100-percent cotton yarndye, it has a super soft feel to the comforter. This set turned out great for our needs. The color of the comforter went well with our bedroom color scheme. Don't know if it's intentional but the other side of the comforter is all grey so it's possible to change the entire look of our bed by just flipping the comforter over. The shams were a bit long since they're meant for king-sized pillows but overall we're very happy with this purchase. Got this set to replace another duvet striped set I had for yrs- This is very attractive, comforter is well made and thick. Very pleased to find this set! I love the muted coastal colors of blue, white and gray. It’s a very heavy comforter, so I saved it for fall and winter. I bought the queen for my Sleep Number Bed and it fits perfectly. The Pillow Sham gives the bed, the finishing touch. Beautiful bedding. Fits bed very well with oversized comforter. Goes well in my sons room. Brightens up the entire space. Very good quality. As a native New Englander, I was looking to add some nautical blue and white stripes to my new home in Tennessee. This did not disappoint. The color and quality is amazing. It is great for chilly winter nights and warmer spring/ summer mornings. I highly recommend if you are looking for a duralable, easy to care for comforter that adds style and comfort to your space. I must have searched for a comforter set for 3 weeks. Finally, I went to overstock and this one. The colors are exactly how it looks in the picture. I am very happy with this purchase. I absolutely LOVE this comforter! It’s plush with soft blue and gray. I was really happy about it’s width, it hangs nicely on both sides of the bed. I bought the Euro pillows and decorative pillow that matches it and love how it looks. I also bought a gray bed skirt to go with it! It makes a perfect Guest Bedroom! This comforter is exactly what I was looking for! The comforter is very comfortable and the colors are perfect. Only thing is I wish they sold the navy and white sheets that are pictured with it. Other than that it’s a great comforter! My daughter FELL IN LOVE with this comforter set at the store...but they were sold out. She desperately wanted to bring it to college, as it was so soft and cozy (yet felt very durable.) SCORE...we found it at Overstock! She brought it to college with her and absolutely loves it!! The colors, the feel and the quality of this Nautical Comforter Set is the best. Highly recommend!!! Looks so nice in my master bedroom. The quality is great for the price, definitely recommend it. Glad I purchased this for our guest room. Looks great with the beach theme we were after. The fabric is very good quality. This Comfoter set is just luxurious! It’s so classy with the simple pattern . The quality is superb. I was thrilled when I found more than what I initially wanted in a comforter set . Clean and fresh looking. Nauticalish - love it! Really cute bedding! I used it in a pirate-themed boys room and just added a few fun pillows to it. The details on it are nice with the different stripes. The colors are just like pictured. The materials are nice too and the wrinkles steamed out easily. Great quality comforter set! Perfect for my nautical look! I love this comforter set. It is perfect for a guest bedroom or the bedroom of a teen which is what I bought it for. I have dark blue sheets paired with it and dark blue throw pillows and it looks great. Perfect for the guest room. Our guests often say how soft and comfy it is. Fast shipping. "Can you tell me what the three pieces are that are included in this set? Is it the comforter and two shams? I'd like to purchase the throw pillows that are included. Can you tell me where I can find them? 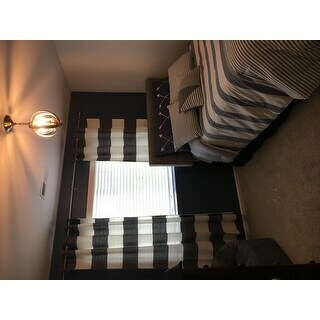 Thank you"
This includes the comforter and the two stripes shams, for twin size one sham only. Additional pieces are not available. "How do you get all the pillow shams/pillows of the set? Which ones are included in the comforter set and where can I find the rest?" "Do you sell the matching sheets??" "I want this set in queen, but the option says “white” I am confused .i want the striped pattern. Please advise if it is actually striped blue and white." This is as pictured blue/white. There is only the one color option available. "Does the set come in twin XL?" No, this is not available in twin XL. This is a cotton yarndye and therefore does not have a thread count. It is however, super soft.